The T-24 was a Soviet medium tank built in 1931. Only twenty-four tanks were built, and none saw combat. This was the first tank produced at the KhPZ factory in Ukraine, which was later responsible for the very successful T-34 and T-54 Soviet tanks. The T-24's suspension was used successfully in the Soviet Union's first purpose-built artillery tractors. The T-24 was found unreliable, and was used only for training and parades. Although the T-24 tank was a failure, it gave the KhPZ its initial tank design and production experience, which was applied much more successfully in adopting production of the U.S. Christie tank as the BT tank series, starting in 1931. This is very much a pre-war tank design with lots of rivets and straight sides. The molding on the parts is superb and right up there with modern standards. 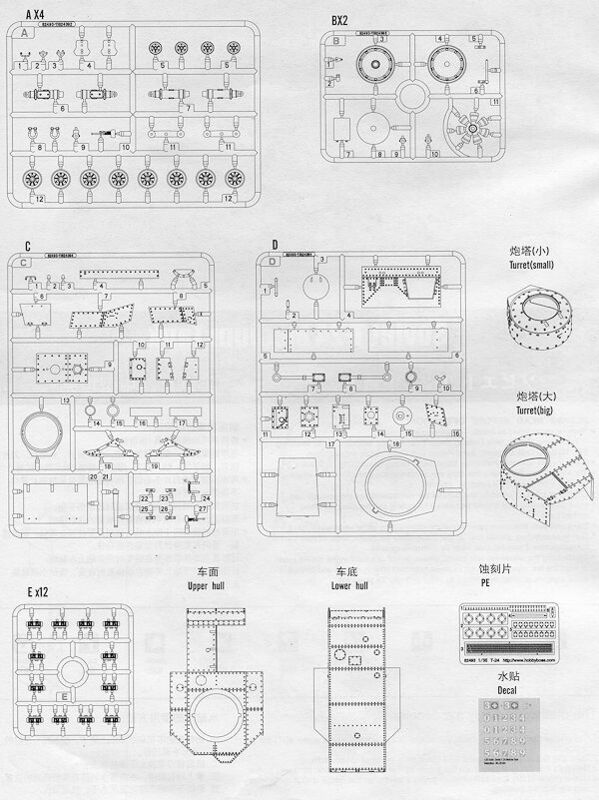 The parts count is prodigious, thanks in part to the 12 sprues of individual track links and the four sprues of road wheels and suspension parts. Each small suspension assembly consists of four road wheels and two return rollers and there are four on each side, so these will be keeping you busy. 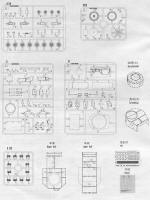 Once all this is attached to the one piece lower hull, you can move on to the tracks and then the upper hull sections. This is constructed of several pieces and includes separate small panels for the view ports, gun ports and some other pieces. There is a separate engine hatch, but nothing under it, though this is a handy feature for the aftermarket crowd. 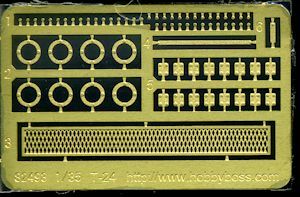 A nicely done photo etch set is included as much because modelers expect it as anything else. The major pieces are for small square plates on each suspension section. The very small bits are bolt heads for various areas such as the attachment points for the tow hooks. There is a strap for the muffler and a screen for the back end of the hull for engine cooling. The rings that are shown fit atop each of the suspension shocks. Typical of Soviet tanks, there is a turret, or turrets, made from bolted plate that are flat on the top and front and with rounded sections on the aft hemisphere. No interior so you just get barrels for the various guns. A bit of a throw-back to the FT 17 is a skid plate that attaches to the rear of the tank. My guess is that this is used to help keep it from rolling over on its back when climbing steep inclines. Instructions are very well done with all the color information on the color and markings diagram. This full color page provides paint references and decal placement. 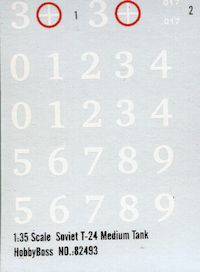 There are markings for one tank and a bunch of additional numbers in case you do not want to do #3. Decals are nicely printed. Not something I would have expected, but with all the 'standard' stuff pretty well done by others, it makes sense that we would start to see some of these lesser known vehicles. 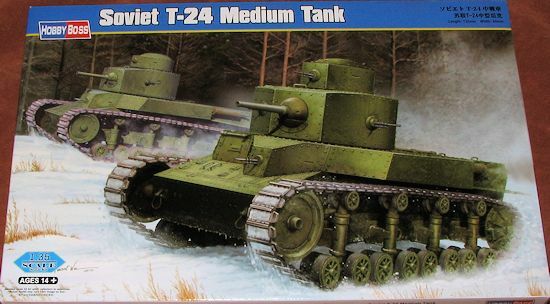 It is an interesting looking tank and is about the same size as the later T-34, so it not a tiny tank.